Ring in the Chinese New Year with this authentic-tasting recipe, inspired by flavours from Cantonese cuisine. 1 Mix the hoisin sauce, honey and rice wine together in a shallow dish to make the char siu sauce. Cut the pork into thin slices and add them to the sauce, coating well. Cover and chill for 20 minutes. 2 Meanwhile, cook the broccoli in boiling salted water for 2–3 minutes until just tender. Drain and refresh under cold water and set aside. 3 Heat the oil in a wok or large frying pan. Remove the pork slices from the char siu sauce, scraping off any excess. Set the sauce aside. Add the pork slices to the pan and cook for 1–2 minutes each side until cooked through with no pink meat. 4 Add the broccoli and stir-fry for another minute to heat through. Pour in the reserved sauce, bring to the boil and cook for 1 minute. 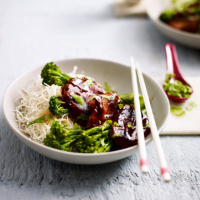 Divide the cooked rice noodles between 4 bowls and top with the char siu pork and broccoli. Scatter with coriander leaves to serve. If you have some dry sherry in the cupboard, use it instead of the rice wine to make a slightly sweeter sauce. This recipe was first published in Wed Jan 13 11:29:00 GMT 2016.